Whether it’s the middle of winter or you simply have no yard, a lack of outdoor space is not a barrier to growing some food. You can grow sprouts in a jar in your kitchen for a fraction of the cost of buying them in the store. Sprouting seeds are sold at health food stores and through online vendors. 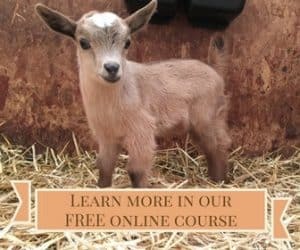 To grow alfalfa sprouts, put two tablespoons of seeds in a quart jar, add a couple of ounces of water, and close the jar with a sprouting lid or tie a piece cheesecloth over the opening. 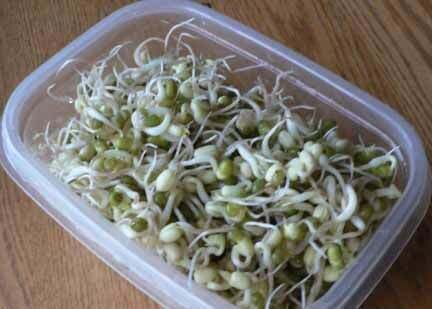 (To grow bean sprouts, pictured above, you can use up to 1/4 cup of seeds in a quart jar.) After soaking overnight or for ten to twelve hours, pour off the water. Two or three times a day rinse the sprouts. You don’t want to leave them standing in water between rinsing, but you also don’t want them to dry out completely. Sprouts that haven’t been rinsed for a couple of days will probably need to be tossed into the compost. The seeds sitting in water in the bottom of the jar will have started to rot, and if they have started to sprout, the seeds on top will have dried out completely and died. I leave my sprouting jar on the kitchen counter next to the sink so I am unlikely to forget about it. 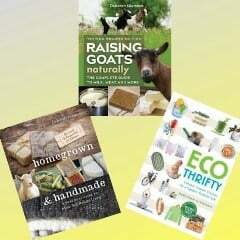 This post is an excerpt from Ecothrifty: Cheaper, Greener Choices for a Happier, Healthier Life by Deborah Niemann.